Two prominent Roman Catholic Church cardinals have urged an end of what they call “the plague of the homosexual agenda”, telling bishops to break their complicity over cases of sexual abuse. Instead, they say the cases involve priests who have “gone away from the truth of the Gospel”. Cardinals Raymond Burke, from the US, and Walter Brandmüller, from Germany, reject that the cases of abuse are a result of “clericalism” – a group of men abusing their power, and protecting each other. Mr Burke is president of the advisory board of the right-wing Dignitatis Humanae Institute, which is setting up a leadership course with Mr Bannon’s help. The cardinals accuse the Pope of failing to answer questions related to whether the Church should allow divorced and remarried Catholics to receive Holy Communion – they are currently barred. The issue, raised in 2016 by four cardinals including Burke and Brandmüller, has caused controversy in the Church, prompting many clerics to question the Pope’s leadership. The mention of this point completely unrelated to Thursday’s summit, and the challenge to the Pope’s authority, shows that clerics who are unhappy with Pope Francis are growing more confident, observers say. The summit is to be attended by the heads of all national bishops’ conferences from more than 130 countries, who will discuss the most pressing crisis facing the modern Church. 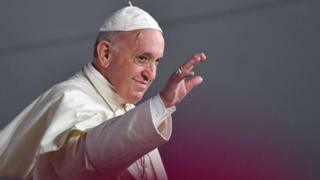 The Pope called for “decisive action” when he was elected in 2013, but critics say he has not done enough to hold to account bishops who allegedly covered up abuse.